“When Ben came over and met her, it was the most awesome thing I ever saw.” — Michelle Converse. When Steelers practice ended and Ben Roethlisberger walked over to 15-year old Jessica Converse, you could just feel the excitement. Because for Converse, the wish she made almost a year ago, was coming true. And her smile was as bright as can be. Converse is visually and hearing impaired, considered legally blind and deaf, and also suffers from an enlarged heart, high blood pressure and is diabetic. 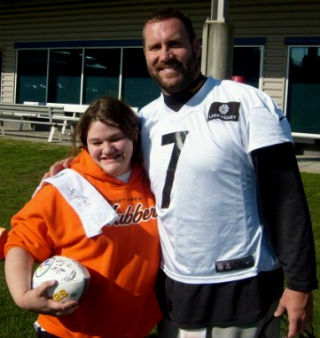 She was the Steelers guest at practice through the Make-A-Wish Foundation, meeting Roethlisberger and his teammates. *Thank you to Ms. Varley and the Steelers! ← Look who turns 1-year old today!